Vilamoura is very different from the rest of the towns on the Algarve. While most of the others were originally fishing villages that were transformed into beach resorts, Vilamoura is a completely new development. It’s characterised by carefully manicured lawns, modern apartment blocks, luxury hotels, golf-themed pubs, and of course the marina that the town is built around. You’ll also find plenty of beach clubs and golf courses, a casino, and plenty of companies offering boat trips. Vilamoura has a long and spacious sandy beach, Praia de Vilamoura, with a pier on either side of the beach, and a lighthouse on each pier. The water in between is calm and welcoming, and behind the beach there are restaurants and bars where you can get refreshments or have a meal overlooking the sea. 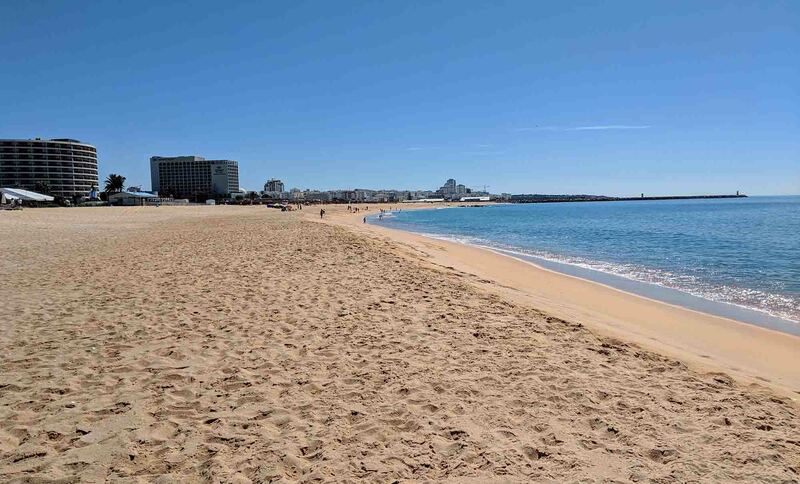 Praia da Falésia, one of the Algarve’s most picturesque beaches, is just a 15-minute drive from Vilamoura, and, from Vilamoura, it’s also fairly quick to get to other beaches like Praia dos Olhos de Água (17 minutes) and Praia de Vale do Lobo (20 minutes). Is Vilamoura right for me? Dom Pedro Marina – 4-star boutique hotel accommodation that’s located right next to Vilamoura Marina with an outdoor pool, hot tub, and an on-site restaurant. The Lake Resort – Situated 300 metres from Falésia Beach, less than 5 minutes’ drive from Vilamoura, this resort offers luxury accommodation with 3 restaurants, 2 bars, and 3 swimming pools. Anantara Vilamoura – A 5-star luxury resort with a boutique spa, 5 swimming pools, and within minutes of some of the Algarve’s best golf courses. While Vilamoura has a lot of things going for it, it doesn’t have the “quaintness” that former fishing villages like Ferragudo or Alvor have. Even Albufeira, one of the largest resort towns on the Algarve, was once a fishing village and so has an old town and several historical attractions. If quaintness is important for you, you may want to consider another nearby Algarve town. Of course, you don’t have to stay in one of those towns to visit them: the Algarve is a small place and it’s easy to get around by car or taxi. 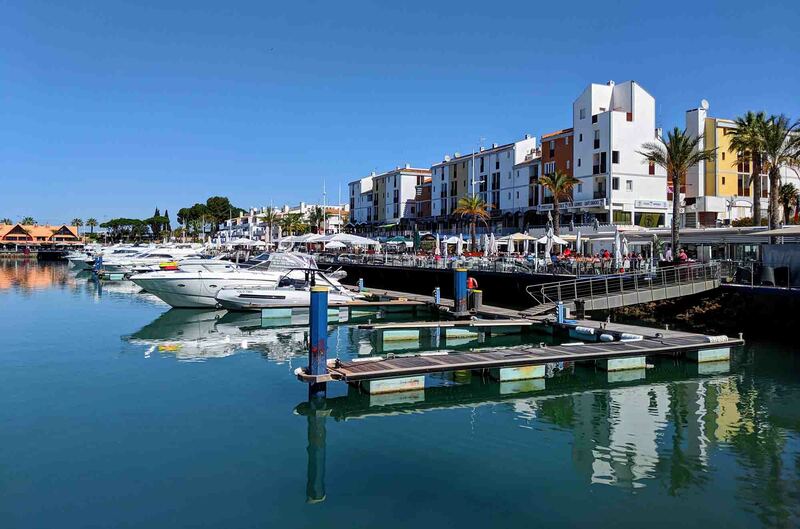 Many people choose to stay in Vilamoura, with its great restaurants and boutique shops, and to take day trips to each of these towns. What Vilamoura does have, however, is high-quality options like high-end hotels and restaurants. There are also plenty of spas and beach clubs where you can pamper yourself as well. If you’re planning on exploring the nearby towns and beaches, but don’t drive, Vilamoura may not be the best option for you. There is no train station in Vilamoura, and bus services often require you to go into Faro, so you’ll probably need to get a taxi to the nearest train station at Loulé to get around. Faro Airport, the Algarve’s regional airport, is less than 30 minutes away from Vilamoura by car, and there are plenty of ways to get from the airport to Vilamoura including airport transfer, shuttle bus, and public transport. Airport transfer: An airport transfer is one of the easiest ways to get from Faro Airport to your accommodation: there’s no need to pick up the rental car, negotiate with taxi drivers, or navigate the local public transport system. You’ll find several companies, including Welcome Pickups, that offer Faro Airport transfers to Vilamoura. Rental car: If you want to explore the Algarve, especially its beaches, the best way to get around is by car. Shuttle bus: Because there isn’t a direct public transport link between Faro Airport and Vilamoura, the easiest affordable option is to book a seat on a shuttle bus. Tickets can be booked on hoppa.com. Taxi (or Uber): Taxis are available from outside Faro Airport, and Ubers are increasingly available as well. Public transport: There is no direct bus or train between Faro Airport and Vilamoura. If you’re taking public transport, the easiest option is to take the airport bus (bus #16) into Faro and then another bus onto Vilamoura. Bus: Buses are available from Faro to Vilamoura, and can be booked on Eva-Bus.com. Train: There is no train station in Vilamoura. You’ll need to take the train from Faro to Loulé, and then to take a taxi from Loulé to Vilamoura. Bus: Long distance buses are available between cities like Lisbon and Porto and Vilamoura and can be booked on rede-expressos.pt. Train: Vilamoura doesn’t have a train station, so you’ll need to take the train to Loulé and then get a taxi onto Vilamoura. Discounts are available if you book your train tickets are in advance, and tickets can be booked on cp.pt.